A lot has gone right for the San Jose Sharks in 2018-19. Superstar defenseman Erik Karlsson (45 points in 52 games) was brought in to bolster the back end, and after an adjustment period, he’s found his comfort zone and allowed the team to excel in transition as well as in possession. Brent Burns (79 points in 79 games) is another play-driving rearguard who looks poised for Norris Trophy consideration once more. As a result, the Sharks control 55.0% of the shot attempts (1st) and 54.4% of the scoring chances (3rd) at 5-on-5. Last season, they ranked 12th and 14th in those respective categories. Meanwhile, Tomas Hertl (70 points in 74 games) and Timo Meier (66 points in 76 games) have grabbed the reins and become pivotal figures up front. Evander Kane (53 points in 72 games) has also seemingly found his home in San Jose as a speed merchant and sniper. Lower on the depth chart, Lukas Radil (11 points in 36 games) has come out of nowhere to provide quality minutes. He ranks first in CF% (57.7), second in SCF% (57.8) and first in GF% (65.4) among Sharks forwards and slots into the top 10 across all those metrics leaguewide. This pleasant surprise has ensured that there isn’t a sharp drop-off beyond the club’s top six. The Sharks were already a solid playoff squad last season, and this year’s developments have forged a deeper and more dangerous group. However, one glaring weakness could very well sink this ship in the postseason. Despite a more balanced roster and stellar possession numbers, San Jose ranks 22nd in goals allowed (3.16) and dead last in on-ice save percentage (89.7). This issue has reared its ugly head during the team’s current 1-7-1 streak, as it owns 57.5% of the shot attempts yet has conceded an average of 4.33 goals per night. Granted, Karlsson and captain Joe Pavelski (63 points in 72 games) have been sidelined with injuries of late. They’re both important contributors who would undoubtedly improve the team’s overall performance, but San Jose’s problems in net existed when they were around as well. Karlsson’s GA60 (3.00) is third-highest on the blue line and Pavelski’s is right in the same ballpark (2.90). In all likelihood, their returns won’t represent a solution so much as a veil to — hopefully — conceal a serious flaw. With free-wheeling blueliners Karlsson and Burns on the roster, a lazy view would suggest that the Sharks dictate a majority of the action but concede too many chances from high-percentage areas. While neither defenseman is shutdown material, the team as a whole is more than competent at limiting opportunities from dangerous areas. It ranks fifth in HDCF% and 12th in HDCA60. 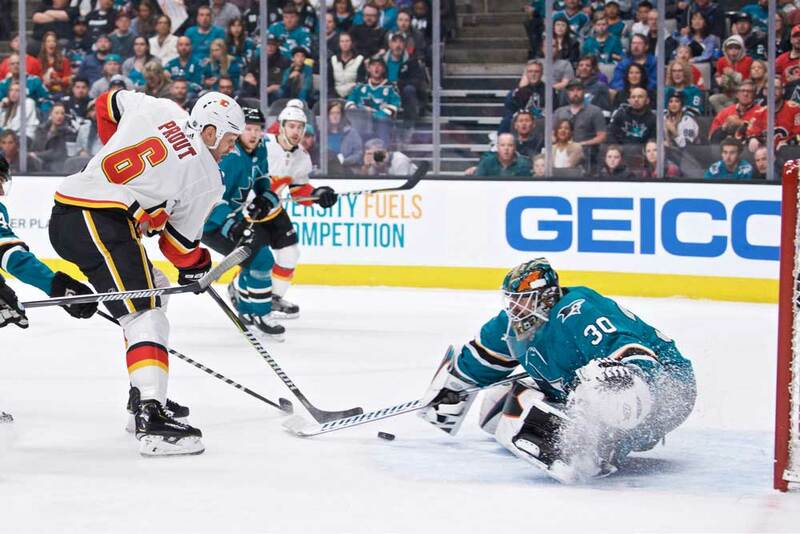 However, the netminding duo of Martin Jones (2.95 GAA, 89.6 SV%) and Aaron Dell (3.23 GAA, 88.4 SV%) has combined to produce the 29th-highest HDSV% (79.0). Yeah, this boils down to awful goaltending. Every team gives up the occasional chance — no exceptions. Contenders such as Winnipeg, Nashville, Toronto, Washington and the New York Islanders allow more high-danger shot attempts than San Jose. The difference is those teams get an occasional big save. Clinching a playoff spot with a sub-90.0 SV% is staggering and speaks to the team’s scoring depth and all-around control over proceedings. That won’t mean much if they can’t shore up the cracks in net, though. So how can they achieve that? Beyond Jones and Dell simply playing up to par, deployment is probably the key here because it’s too late in the season to implement new defensive schemes. Looking at the personnel on hand, a couple of pairings are obvious. When Karlsson returns, he should be slotted next to Brenden Dillon. Together, they’ve posted a 60.8 CF%, 58.5 SCF% and 61.1 GF%. The former’s puck control and uptempo pace tilt the ice toward the opposition’s cage, while the latter is a sturdy defense-first rearguard with a pretty good feel for his partner’s tendencies. Not only are their numbers as a pairing superb, they’re also significantly better together than apart. The tricky bit is finding a suitable foil for Burns. The 6’5”, 230-pound rover is a chance-generating machine who covers a lot of ground, but he’s prone to lapses in judgment. Radim Simek was a revelation in that role, as the 26-year-old free agent offers a nice blend of physicality and hockey IQ. Though Burns’ shot and chance shares are similar regardless of his partner, his GF% skyrockets with Simek. More specifically, his GA60 shrinks from 3.22 without Simek to 2.17 with him. Unfortunately, the newcomer tore his ACL and MCL in mid-March and is out for the season. That’s horrible timing and has forced Joakim Ryan into the lineup. Again, the possession numbers are great, but a 3.37 GA60 and 48.8 GF% won’t cut it. Offensive defenseman Tim Heed is another option, although head coach Peter DeBoer might hesitate to pair two right-handed shots together. Heed and Burns have produced stellar numbers (59.3 CF%, 56.2 SCF%, 100.0 GF%) in limited minutes, but there’s no telling how Heed would handle an extended look with more responsibility. With that said, the fate of this defense may hinge upon Marc-Edouard Vlasic and Justin Braun — or rather how they’re used. Once the two most dependable members of the blue line, the veterans have declined in dramatic fashion over the past couple of years. Vlasic’s slide is particularly significant because he was so effective as a lockdown defender a few seasons ago. His GA60 and HDCA60 have steadily increased recently and ballooned to career-worst marks in 2018-19. He ranks second-worst among Sharks defensemen in both categories, which reflects the opposition’s ability to get to scoring areas and convert when he’s on the ice. That sounds odd to say about Vlasic, who was previously such a stingy blueliner. DeBoer appears unwilling to face this reality, as Vlasic and Braun both average over 20 minutes of ice time per game. They did when Karlsson was in the lineup as well. Sure, penalty kill usage must be taken into account…but they’re awful there too. They’ve allowed far more shot attempts, chances and goals than their counterparts. While it may be a tough pill for the bench boss to swallow, he should cut their minutes down and rely on his more dynamic horses when the team is healthy. San Jose must attack in waves with as little letup as possible in order to mitigate the situation in net. That’s about all the team can do right now. Your goaltending can’t be sheltered from start to finish. At some point, it has to perform to at least a mediocre standard because even the tightest defenses concede chances from time to time. Considering the Sharks’ slump and a matchup with the Vegas Golden Knights looming on the horizon, Jones and Dell need to start carrying their weight in a hurry. Otherwise, San Jose will struggle to play with any semblance of confidence in the postseason. Opponents will notice, and they will pounce. When your Achilles heel is this visible, it doesn’t take much for the foundation to crumble.